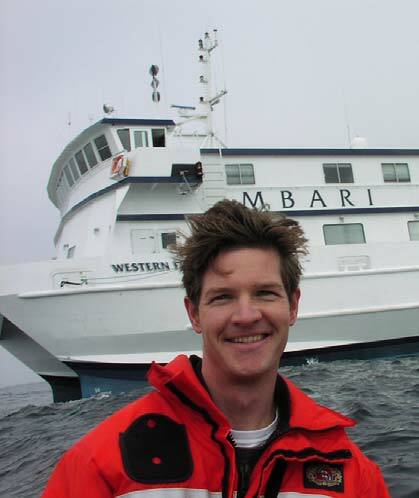 TAS Noah Doughty with the Monterey Bay Aquarium Research Institute R/V WESTERN FLYER in the background. Dr. Rock and Kristof Richmond of Stanford University left the ship late yesterday afternoon, wrapping up the image collection for the photo-mosaic. Leaving with them was John Geoghegan, a writer for the Smithsonian Air and Space Magazine and the Naval History Magazine. Joining the expedition are Scott Rayder, NOAA Chief of Staff, Richard G. Van Treuren, representing the Naval Airships Association, and Tim Thomas from the Maritime Museum of Monterey. Today’s activities were devoted to groundtruthing side-scan sonar anomalies located away from the two main debris fields. This is accomplished by simultaneously moving the ROV and the WESTERN FLYER from site to site, a process that would take the better part of an hour depending on the distance being traveled. The transition provided me with an opportunity to briefly operate the “Science Cam”, the seat were you get to operate the zoom, angle and focus of the HDTV camera. Most of the anomalies were shallow depressions in the muddy bottom with two large sonar hits turning out to be old fish traps. We did find one large artifact resembling an imploded fuel cell quite a ways from the main debris fields. Today is the last day of the expedition and I would like to take the opportunity to thank the NOAA Teacher at Sea Program, the Monterey Bay National Marine Sanctuary Program, and the Monterey Bay Aquarium Research Institute for the opportunity to be part of such an amazing experience. Finally I would like to thank the ROV Pilots of the Tiburon and the crew of the WESTERN FLYER for providing insightful answers and explanations to a number of questions. Work at the USS MACON wreck site continues, alternating between mosaic work and survey work depending on water conditions at the bottom. Today’s log will profile two members of the expedition whose jobs provide a context for the information being gathered. 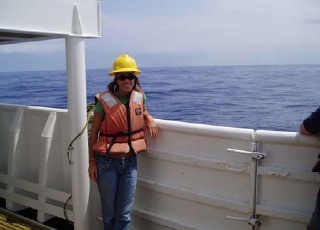 Erica Burton works for the Monterey Bay National Marine Sanctuary and is responsible for operating VARS, which stands for Video Annotation and Reference System. VARS is a database that allows screen images to be captured, logged, and georeferenced with annotated notes. For the MACON expedition these notes list the possible identity of the artifacts. In addition to the captured image, VARS also records the time stamp in the video and a geographical location. All the images and video captured are archived at MBARI (the Monterey Bay Aquarium Research Institute), and later, in conjunction with the National Marine Sanctuary Program, staff will process and interpret to produce a final photo-mosaic poster that will be made available to the public. Burton, who has a background in marine biology, also notes that the USS MACON wreckage provides an artificial hard-bottom habitat in an otherwise soft-bottom habitat, and the organisms observed are primarily soft-bottom fishes with occasional encrusting organisms on the wreckage. 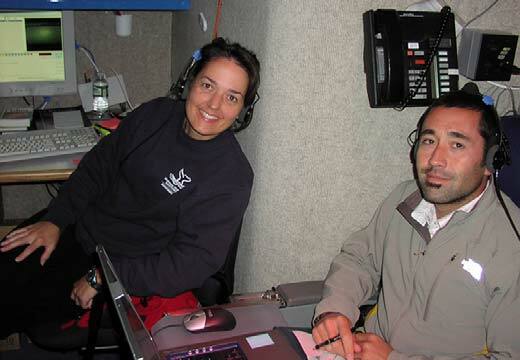 Erica Burton, on the left, operates VARS (Video Annotation and Reference System), and works for the Monterey Bay National Marine Sanctuary. 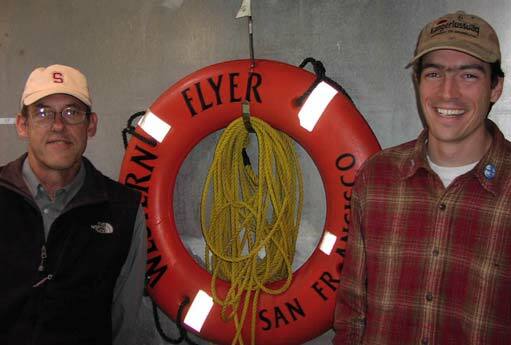 Lee Murai, on the right, is the expedition’s GIS (Geographical Information System) analyst, and comes from Moss Landing Marine Laboratories. Lee Murai is a Geological Oceanography student at the Moss Landing Marine Laboratories and is the GIS (Geographical Information System) analyst. Through GIS software he is able to spatially organize the data collected on this expedition and compare it to the 1990 and 1991 expeditions. Types of data collected in the past include side-scan sonar, multi-beam bathymetry, and waypoints collected by Remotely Operated Vehicles (ROVs) and manned submersibles. For this expedition he is working closely with the Stanford University team to assist with the photomosaic collection procedure. The GIS map posted on day 1 was provided by Murai. Compare that to the low-resolution image tiles posted today. While the use of GIS is relatively new to the field of marine archeology, it is generally used in marine environments to provide geologic and biologic habitat characterization maps. This image, created with low-resolution copies of the image files, shows a Curtiss F9C-2 Sparrowhawk (plane #4 in the GIS map on the Day 1 log). High-resolution tiles will be fused into the final photo-mosaic. The nose of the plane is in the lower left. Vials of preserved mahi-mahi larvae captured with an Isaacs-Kidd net off the Kona coast of the Island of Hawaii, during a plankton research cruise. Yesterday, the routine was very similar to Monday. The NOAA ship was 45 miles out, performing plankton tows from 6 a.m. to about 7 p.m. We did not catch much billfish larva or eggs, but we did catch a lot, I repeat, a lot of little fish. We were even catching baby tropical fish that must have got caught on the giant seaward current that runs offshore of the big island. Unfortunately, I got very sea sick “again” mid afternoon, and wasn’t able to do much but take photographs of the plankton. I did how ever, get some “killer” microscopic photography shots and some very cool, short videos of live plankton species in action. OSCAR ELTON SETTE traveled through the night and we finally got back to the Kona coastline, about 1-2 miles offshore, where it was calm. I, finally, got to sleep that night without being seasick! In the morning, the island rose out of the mist and exposed beautiful hues of tropical greens against the dashing blue sky and crystal clear turquoise waters. Today, sadly our last day, we are performing plankton tows amongst the coastal “slicks.” Now what is a slick you ask? Well, according to Russell, one of the lead scientists with us from La Jolla, California, the slicks are formed due to wind currents coming off the island that gently push down on the water’s surface forming a glassy phenomenon amongst a rippling environment. Here, due to the stillness and protection, millions of larva fish and some human trash harbor. The fishermen who are catching baitfish usually troll their nets through here. The interesting aspect that Russell talks about behind these slick communities is that they “are aged.” Some are very young because the spot has been recently open, and some are more mature and older because nothing has bothered them. Today, we hunt through these slicks in hopes of finding billfish marlin eggs and larva. We hit one slick that gave us a bunch! Then we spent the rest of the day getting nothing, and hunting for that original slick. I got many more photographs with my Olympus Mic-D microscope of which both Bob and Russell got copies. One fun thing the scientist and I did today was “pose” in the laboratory for National Geographic pictures taken by David the author of Archapelago. We were still searching for eggs in the newly caught plankton and doing our work, he just made the station and set-up look good. It would be SO cool to end up in an article of National Geographic. That I’ll have to show off and frame! At 3 p.m., I left the ship in view of waving hands and smiling faces from all the crew. It was sad, but what an unforgettable experience I have had these past four days. After being sick for the last 2 days, barely being able to walk through the ship to my room, let alone type on a computer, I finally took some Bonnie medicine from the ships nurse, Sarah. After three days out at sea, doing the same thing every day, every hour, I start to realize the required monotony and dedication of scientific research. In order to accomplish a desired goal of finding out a particular question, such as which billfish eggs and larva turn into which adult species; a lot of repetitive analysis and trials must be done in order to come to a clear consensus or even obtain part of an answer to the overall question. Having been a tall ship sailor for two years, my mind wonders to historical maritime scientific expeditions, such as the three-year voyage of H.M.S. Challenger in the 1800’s; John Steinbeck’s journey through the Sea of Cortez; Darwin’s five-year Galapagos voyage on the H.M.S Beagle; and even to Nathanial Bowditch grasping celestial navigation with no background experience out at sea. These men not only had to endure environmental changes of heat, wind and rain while trying to collect scientific samples, but also had to compensate research time versus sailing obligations when seas became rough, or duty called. Imagine, instead of simply taking pictures of the plankton found (with your Mic-D microscope), you had to literally draw each organism with only a magnifying glass as an aid. It is just incredible how far we, as mankind, have come towards uncovering the mysteries of the ocean within only the past 200 or so years. Yet, it is even more astounding to know how much we have yet to still uncover. Imagine a plate showing only a 10% sliver of a colorful picture underneath. There is no way we would be able to guess what the picture is displaying. This is our world’s ocean knowledge. There is so much work to be done and to discover that it is essential for the next generation and the one after that to know that they can still be a Jacques Cousteau or a Charles Darwin, discovering and revealing secrets only the giant whales can see. Imagine marveling at a newly discovered specimen in admiration of the diversity of the sea. As with all maritime sailors, ocean goers, and even pirates, the ocean is our home. I had an opportunity on the NOAA ship OCSAR ELTON SETTE to simply look closer at it and view its secrets for just a brief moment along the great span of time. TAS Jenny Holen taking a break from the rigorous microscopic search for billfish larva and eggs aboard the SETTE 45 miles out from the Big Island of Hawaii. 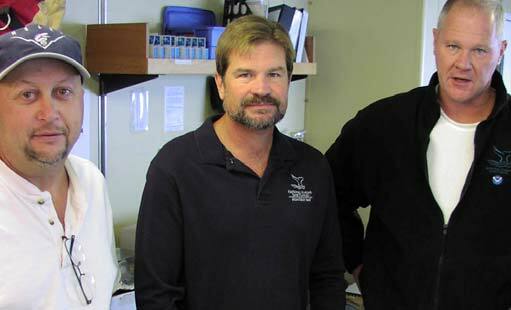 Principal Investigators, left to right: Chris Grech (MBARI), Robert Schwemmer (CINMS), and Bruce Terrell (NMSP). Question 1: Has the condition of the wreckage changed since the first visit in 1991? GRECH: Yes. There is more sediment on the bottom than before. Some of the smaller pieces of debris are no longer visible. Meaning they have been moved, covered up, or corroded. Overall the major features are still there, the Sparrowhawk’s and the Maybach’s engines. Question 2: What technology is being employed this time that wasn’t employed before? Underwater image of the Curtiss Sparrowhawk F9C-2 port wing. Note it is still possible to make out the Navy Star painted on the wing fabric. Positioning, a system where a GPS (Global Positioning System) coordinate is set and the ship is automated to maintain that position. Question 3: What might eventually happen to the wreck site in terms of protection policy? TERRELL/SCHWEMMER: The MACON already has the ultimate protection regimen. The wreckage is within the boundaries of the Monterey Bay National Marine Sanctuary, and the Sanctuary has a clearly defined mandate to protect archeological resources. The US Navy still owns the MACON and the Navy has its own legislation to protect submerged vessels and aircraft. Last, the wreck site is within State of California waters and so is protected by state law. From the data gathered on this cruise we will do three things. First is to generate a report on the project that will go to the NOAA Office of Ocean Exploration, who provided much of the funding. Second will be an archeological assessment that will go to the National Marine Sanctuary Program and to peers. This assessment will include management recommendations regarding the values and needs of the wreck site. Third will be to begin the process to nominate the MACON to the National Register of Historic Places. This is a one to two year process. 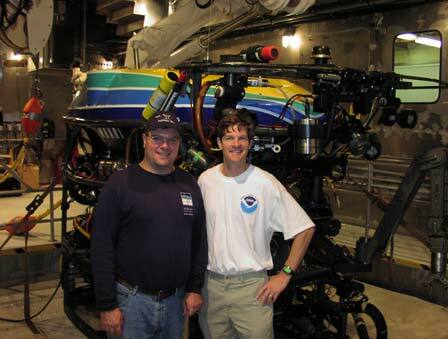 Dr. Steve Rock (left) and Ph.D student Kristof Richmond (Right), from Stanford University. Today the photomosaic team from Stanford University, Dr. Steve Rock and Ph.D. student Kristof Richmond, stepped up to direct underwater operations. Currently there are two known debris fields. The larger field contains the Curtiss F9C-2 Sparrowhawk airplanes, five of the eight Maybach Engines and remnants of the galley. The second debris field contains the bow end of the MACON with identifiable artifacts from the officer’s quarters and the mooring mast receptacle. A third debris field, containing the tail section, is speculated to exist but has never been found. In spite of some challenges we managed to mosaic both of the known fields. The photo-mosaic will be created using a control system designed by the Stanford team to pilot the Tiburon along a series of parallel transect lines, a pattern playfully called “mowing the lawn.” As the ROV travels above the seafloor along its transect line, a High Definition Camera periodically captures images that are assembled to create the photo-mosaic. Due to the low light and at times murky conditions, the camera can’t be more than a few meters off the sea floor. Imagine trying to create a picture of your local soccer or football field by walking the entire field holding a camera at arm’s length facing straight down. Tomorrow we will continue the photo-mosaic efforts! 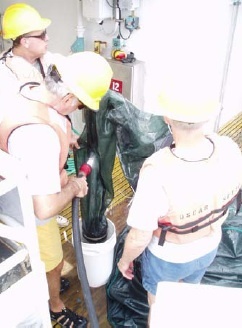 NOAA researchers aboard the SETTE, cleaning off the residue plankton still attached to the net into a plankton container. 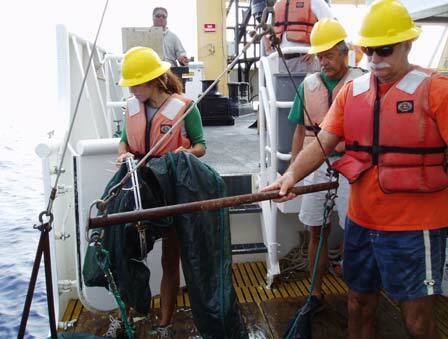 The plankton tows have not been as successful as the chief scientist, Bob Humphreys, would have liked. 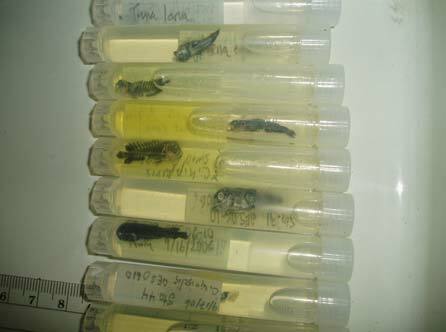 Few billfish larva and eggs have been found, and more are needed to generate a genetic analysis sample. Bob believes this might be due to an eddy that is forming about 45 miles off shore, swooping the plankton out there. As we slowly start to migrate offshore, we are still obtaining plankton samples every hour until sunset. Today, instead of helping to look for billfish eggs, I took microscopic plankton photographs with my Mic-D microscope given to me by NOAA’s South East Plankton Monitoring Network program, in South Carolina. These individual plankton species photographs will be a get asset to the lesson plans I am generating from this research expedition of which could ultimately be used by teachers all over the world through NOAA’s website. The plankton samples that we got today were almost the same as they were yesterday, nothing too new. However, I did get some background information on why this particular study is so crucial to the future survival of large billfish, such as Marlin. Currently, some scientists believe that blue Marlin may be migrating between Hawaii and South America, but others are still not sure. Hawaii is a nursery ground for the larval and probably juvenile stages. Adults are migratory and apparently have a magnetic sense that allows them to migrate across to South America where there may be higher food nutrients. The importance behind obtaining this knowledge is to help conserve the declining population due to commercial and sport fisheries. If we knew where the mothers primarily spawn and if there are resident verses transient populations, than we could gain a better grasp of their overall ecology, life cycle, and habitat range. Unfortunately, the farther away from the island you go to get this valuable data the less protected you are from wind and large waves. Hence, at about lunchtime I got extremely seasick and was out of commission for the rest of the day. I hope enduring all of the rocking and rolling will give rise to better plankton samples tomorrow! G. Wrobel & C. Mills. 1998. Pacific Coast Pelagic Invertebrates. Once again, I am amazed to witness and be part of a science research expedition that portrays through every member of the ship, from the cooks to the deck hands and Bridge Officers, the enthusiasm and positive attitude for the current research at hand. Everyone here is extremely helpful, especially when I got sea sick and ending up hurling in a bucket in the kitchen. The professionalism is evident by everything they do, which gives an air of importance towards the research being done. I wish more people, teachers, and high school to college students could participate in an experience like this. It takes the illusion of scientists being a far away myth to being a regular Joe who cares about the environment and the conservation efforts towards the animals it holds. Another cool thing about this trip is that the author from the acclaimed book Archipelago (the North West Hawaiian Islands) is here on the ship taking photographs of all the unique plankton we are catching for a National Geographic article. I think that is amazing to know that not only is this research voyage being documented by NOAA scientists, but that the world will get to see and learn about plankton through journal media. Education is the key to conservation. 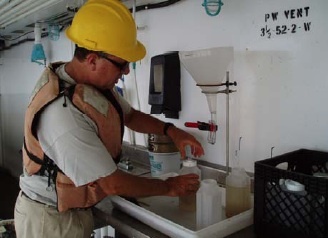 NOAA chief scientist, Bob Humphreys, taking the freshly caught plankton and transferring it from a funnel into quart bottles, to be later filtered again into higher concentrations which will be viewed underneath microscopes. Today I interviewed one of the head scientists of the plankton cruise. His name is Michael Musyl working with NOAA through the University of Hawaii in Oahu in conjunction with the Joint Institute for Marine and Atmospheric Research (JIMAR). Michael had always had an interest in fisheries ever since he was a kid, fishing from a fishing pole. He took his education career after high school to Northern Illinois where he got his B.S. in zoology. After which, Mike did a five-year masters program in fisheries Biology from the University of South Dakota, to then go on and get his PhD from New England in Freshwater fish population genetics. He then used his knowledge and experience with the Arizona Fish and Game department for two years and then taught college biology and ecology for one year at the University of New Orleans. Mike decided to go get a post doctorate from South Carolina in molecular genetics of blue fish tuna and ended up working with NOAA on electric tagging of pelagic fish and sharks through the University of Hawaii. Mike is currently studying the post release survivability of these fish through archival tagging which broadcast the information to satellites. He is also studying the post release mortality of fish captured in long line nets, to see how long they live after being rescued. A typical year of work for Mike is answering emails, collaborating with fellow scientists around the world, developing and maintaining research projects, analyzing data obtained from research expeditions, writing about four to five papers for journal publications, and spending about 50% of his time on ships like OSCAR ELTON SETTE obtaining project data. Life as a scientist is busy, as well as exciting! 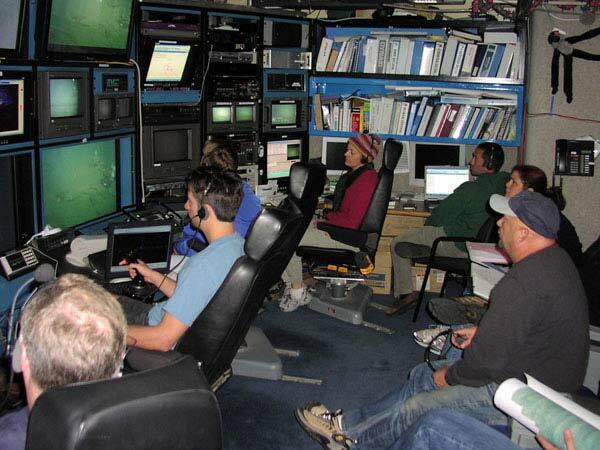 The science crew in the Control Room of the WESTERN FLYER as we watch video from the Tiburon. Greetings from the sunny coast of California! Today aboard ship we began to survey the wreck site of the USS MACON, a US Navy Dirigible and its Sparrowhawk airplanes. The MACON, a rigid airship referred to as a “flying aircraft carrier,” sunk off the coast near Big Sur, just south of Monterey, on February 12, 1935. 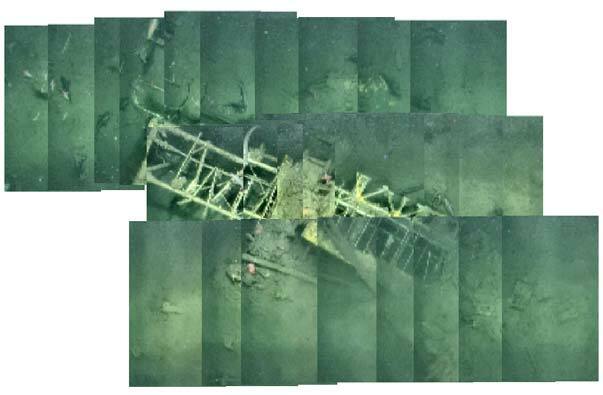 The goal of the survey is to create a photo-mosaic image of the wreckage. To accomplish this we are using a remotely operated vehicle (ROV) called the Tiburon. Much of today’s operations centered on getting the ROV into the water early with the camera at a 45-degree angle to capture as many images of the wreck area as possible. 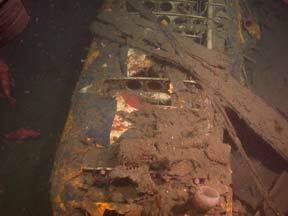 Plus it enabled the scientists and historians on boat to get a feeling for the condition of the wreckage. Altogether we found all four of the airplanes, each in a different state of decomposition, but some parts remarkably well preserved (we could make out part of a star painted on one wing). One of the things the scientists did was to make a GIS map of the wreck site. The real work begins tomorrow when researches from Stanford University begin a two-day project to create the photo-mosaic of the area. 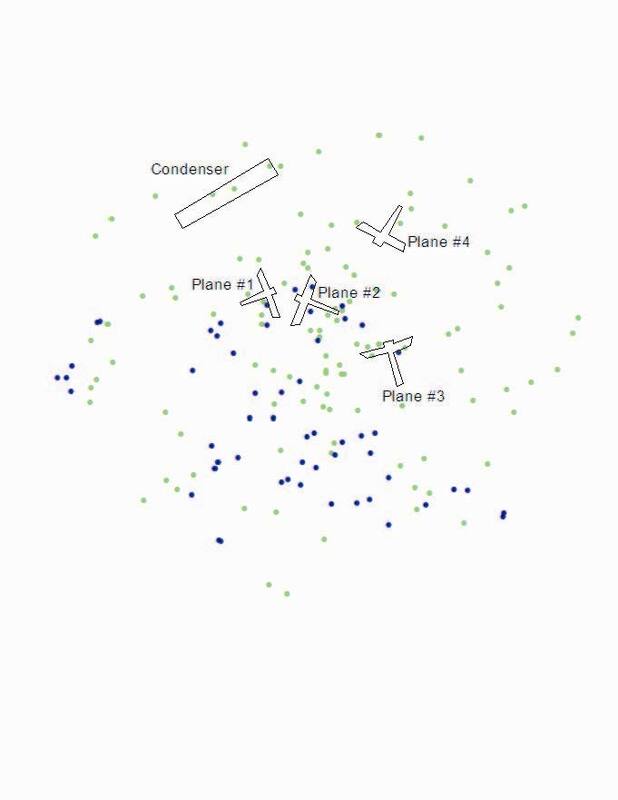 GIS map of the MACON wreckage. Outlines indicate approximate location of various objects.